What do you consider a successful promotion? In most cases, a promotion's success is determined by whether or not it achieves its outset objectives (generating awareness, signups, brand affinity, etc.). Chevrolet redefined "promotional success" with the Chevy Malibu Million Dollar Shootout, a promotion that recently occured during the Colorado Avalanche vs. Vancouver Canucks game on February 27th. The promotion, offering one (1) lucky contestant the chance to win $1 million dollars if he could shoot fifteen (15) pucks into a net from the opposite blue line in twenty-four (24) seconds. Prior to this taking place, the contestant and his/her friends have a chance to win up to four (4) Chevy Malibu cars. Sounds like a great idea, but nothing out of the box. Why was this promotion so great? It was a national Canadian promotion (Chevy aligned with TSN Canada) that generated 8.6 million online registrations. That is astounding. Which must mean: Canadians love hockey, they love money, and hopefully for Chevy, they will love purchasing new Chevy Malibu's (we know how much they love Don Cherry and Tim Horton's). In all, the promotion was executed to perfection (Well informed emcee who built excitement around the promotion, crowd involvement, engaged participants, and a strong tie-in of media coverage - televised live on TSN Canada and TSN HD). I forgot to mention, the contestant, Darwin Head won! However, whether there was a winner or loser, the promotion was a HUGE success for Chevy and should serve as a benchmark for your promotions. 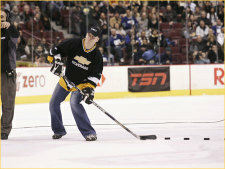 FYI: The Chevrolet Malibu Million Dollar Shootout will return in 2009 at the IIFH World Junior Championship in Ottawa.